A colorful glass facade stands out in the Río Hortega Hospital complex in Valladolid. It is the library, a space that can boast of being a bright space, but above all full of color. The Río Hortega Hospital is an "Inglada-Árevalo Arquitectos y Asociados" project and its construction took 8 years. The result was a building with only three plants growing horizontally instead to do it vertically (about 120,000 square meters of built surface). With a functional and modern design, the hospital is structured in four large blocks, linked by a central corridor and surrounded by green areas. 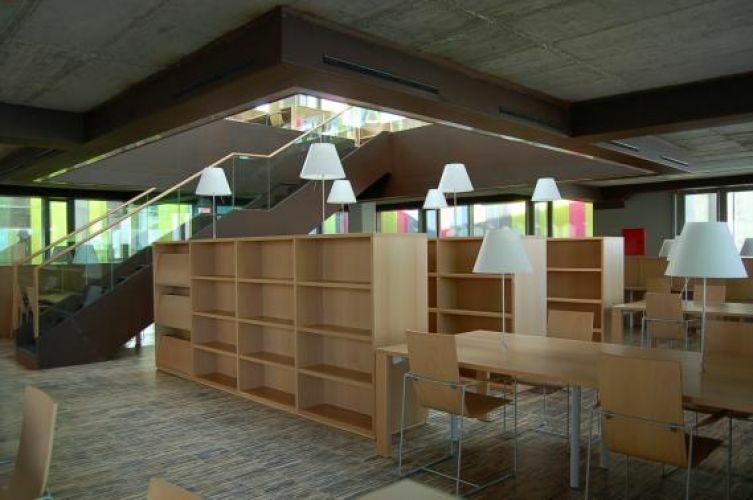 Specifically, JAKIN Shelving Modules were used for the Rio Hortega library. The advantage of this system is that it offers you the possibility of customize the design: it allows you to add all the modules required by the space; offers different options of height, width and depth; and can be combined with other elements such as doors, drawers and bifacial shelves. In addition to the shelves, the JAKIN Study Tables were used to equip the Río Hortega Hospital library. For the seats of the library, the HAMMOK Chair was chosen in its Dinner version. A comfortable seat with a lower angle of inclination than the other HAMMOK versions. In this way, it allows users to be in a perfect position to concentrate on reading. The HAMMOK Chair stands out for its lightness. It presents a soft and ergonomic frame that provides flexibility to the seat, and offers the wearer a pleasant rocking effect when sitting. A seat in which comfort and concentration are assured.